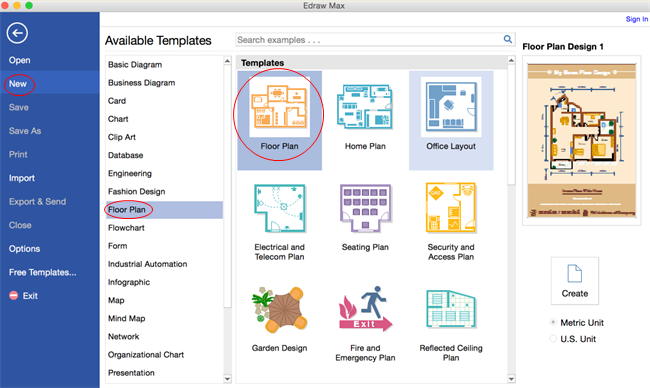 Learn how to create floor plan on Mac OS X easily and quickly. Use automatic floor plan software equipped with smart shapes to create floor plans in an amazingly simple way. Firstly, open a blank drawing page and the libraries including shapes needed for creating floor plans. On the File menu, point to New.-> Click Floor Plan. 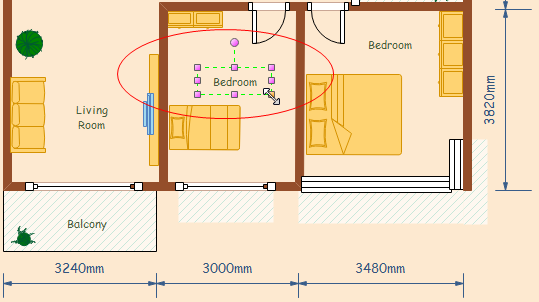 Choose the type of floor plan you want and then double click its icon. 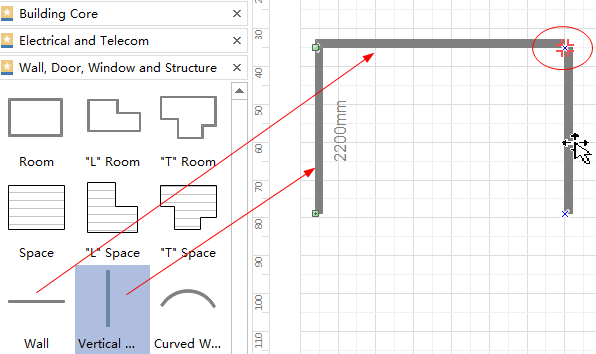 Go to Floor Plan menu of the Ribbon, in the first Scale group, input a drawing scale value in the box or click the arrow besides the box to choose one drawing scale from the drop-down menu. From the left libraries, drag and drop shapes to the canvas. As you drag or move a shape, gridlines and dynamic blue guidelines help you align it with other shapes. Drag room shape or wall shape to form the exterior wall structure. Drag the green square handles to resize floor plan shapes or double click the dimension text to type the length or width value. Connect walls by dragging one wall to another. When the connection point turns red, release the mouse and two walls will be glued. Intersections between two walls are cleaned up automatically. Add more wall shapes to form the interior structure. Drag a door shape and move it towards the wall. When the wall turns to dark red, release the mouse. The door will be automatically aligned and glued to the wall. To set the opening direction, go to Home tab to click Rotate and Flip button. Drag the yellow control point to change the door opening angle and direction. Change a shape's color and border by clicking any quick style under the Home tab in the Styles group. 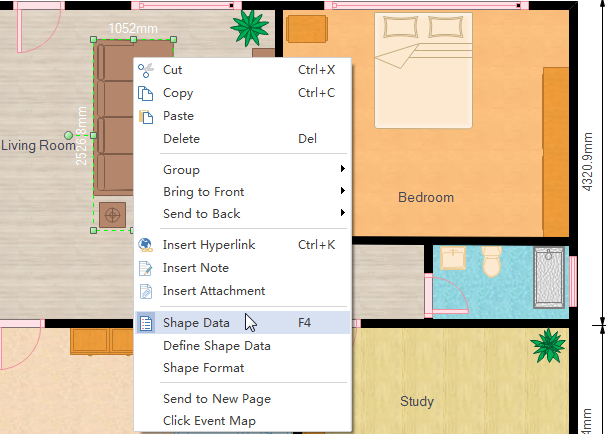 Another fast way to edit floor plan shapes is to right click the shape. Dimensions can be added to the floor plan to show precise measurement and scale. The dimensioning library has included lots of smart dimensioning symbols that enable users to draw interior dimension, exterior dimension, angular dimension, radius dimension and much more. Double click a shape or a table to type in text. -> Press Ctrl + 2 to add more text boxes. Press Ctrl + shift + 2 to adjust text box. The text box turns purple. Choose a different font under Home tab. Customize the size, color and alignment by clicking the relevant menus. Click the arrow under Font Color for more Paragraph settings. By changing floor plan theme, you can enhance fill, line and text style altogether at 1 click. 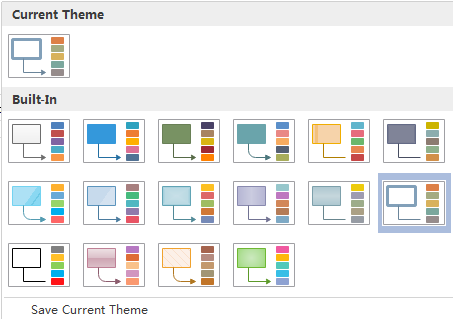 Switch to Page Layout tab, apply another theme in Themes group. 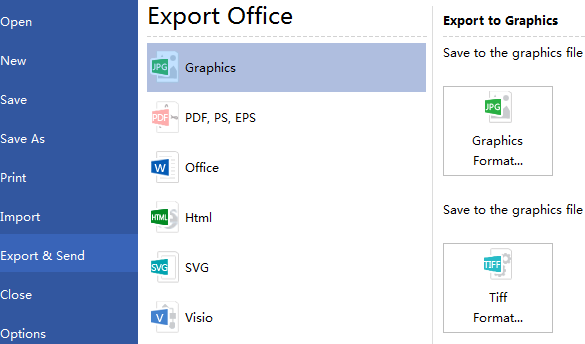 Hit Export & Send under File to export the floor plan as images, presentation slides and web documents and so on. Click File tab; choose Print and then the print setting and preview window shows. You can choose which pages and how many copies to print here. If the drawing page is larger than the print paper, the drawing will be printed on more than 1 paper. To print it on only 1 paper, click More Print Setup... and then choose Fit to.